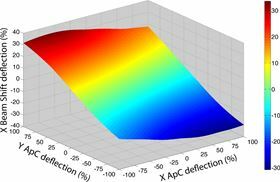 X beam shift calibration as a function of X and Y ApC deflections. Collection of selected area channeling patterns (SACPs) on a high resolution FEG-SEM is essential to carry out quantitative electron channeling contrast imaging (ECCI) studies, as it facilitates accurate determination of the crystal plane normal with respect to the incident beam direction and thus allows control the electron channeling conditions. Unfortunately commercial SACP modes developed in the past were limited in spatial resolution and are often no longer offered. In this contribution we present a novel approach for collecting high resolution SACPs (HR-SACPs) developed on a Gemini column. This HR-SACP technique combines the first demonstrated sub-micron spatial resolution with high angular accuracy of about 0.1°, at a convenient working distance of 10 mm. This innovative approach integrates the use of aperture alignment coils to rock the beam with a digitally calibrated beam shift procedure to ensure the rocking beam is maintained on a point of interest. Moreover a new methodology to accurately measure SACP spatial resolution is proposed. While column considerations limit the rocking angle to 4°, this range is adequate to index the HR-SACP in conjunction with the pattern simulated from the approximate orientation deduced by EBSD. This new technique facilitates Accurate ECCI (A-ECCI) studies from very fine grained and/or highly strained materials. It offers also new insights for developing HR-SACP modes on new generation high-resolution electron columns. This paper was originally published in Ultramicroscopy 149 (2015) Pages 34-44. A new technique that uses an electron beam to burn tiny windows into a polymer can measure the catalytic activity of 2D materials.